Marine reserve proposal by the Department of Conservation. This document contains all the text of the original proposal as printed on a 16-page glossy brochure. The text in blue was provided by us to illustrate or rebut statements. The original PDF document can be found here on the DoC web site (577KB+form). Recent images of the underwater world (June 2003) have been added. Marine Reserve status: Proposal stage. Closing date for objections is 30 June 2003. Print this form to support/object. The seas around Great Barrier Island are some of the most pristine in the Hauraki Gulf, with a remarkable variety of underwater landscapes and marine life. However, even here, locals are reporting that fish aren't as plentiful as they used to be. A marine reserve will ensure that at least one part of Great Barrier's marine world is protected and replenished to pass on to our children and grandchildren. Unfortunately, this area is no longer able to replenish itself since it is degrading rapidly. Yet this was not caused by fishing. It makes no longer sense to have a marine reserve here because the main problem of our coastal seas, which is also manifest here, is the devastating influence of land-based pollution. What is needed are measures to increase the fish stocks throughout the Hauraki Gulf, and around Great Barrier. Over a decade ago , the Department of Conservation began talks with tangata whenua and local residents about the need to protect Great Barrier Island's coastal waters. Keen to establish a marine reserve somewhere around this island, DOC circulated a public discussion paper and questionnaire in February 1991. Over 250 people, mainly islanders, sent in their comments. This is a marine reserve proposal with history. As part of the consultation process during the lead up to the 1994 marine reserve application, a steering committee was formed at a public meeting held at the Claris Sports Club. This committee was chaired by John Graham and was made up of a cross section of the community, including representatives from the South, Central and North Barrier communities, professional and recreational fishermen, non-fishermen, at least one DoC worker. 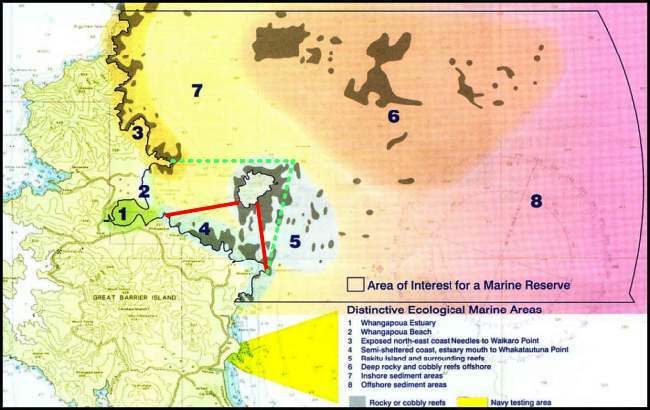 This group eventually recommended that there was local support for a small marine reserve as shown with the red solid lines on the map, corresponding to the 1991 proposal. There was no support for any reserve larger than that. This early feedback expressed both concern over the decline in the island's fisheries, and strong support for a fully protected marine reserve on the island. The north-east coast was the favoured location for 75% of the people who wrote in. Most respondents (65%) claimed that a marine reserve would not cause problems for their current activities in the area. However, three percent were totally opposed to any marine reserve. Restrictions on fishing were the key concern. Time and again, DOC quotes strong support, whereas this was not so. For instance, at the Great Barrier Community Board meeting of 31 May 2003 the proposal was voted down almost unanimously but this was reported by DOC as: the vote at the meeting that was held on GBI at the weekend was for the proposal as it currently stands. Indeed the vote was about the current proposal. It is sad that we can no longer trust our Government which is employing war techniques of propaganda, disinformation and division. Note the precise wording in the questionnaire: Do you support the principle of a marine reserve somewhere on the north-east coast of Great Barrier Island? Yes/No. What are people supposed to answer when they are against the present proposal but not against a small reserve somewhere else? The first and foremost question should have been: Do you support this proposal? Yes/No. Earlier discussions about possible boundaries for a marine reserve centred on an area including the Whangapoua Estuary and beach, the coastline immediately north and south of Whangapoua and the seas out to and surrounding Rakitu Island. In the years since, DOC has been carrying out further marine studies in an area extending from Needles Point in the north to Korotiti Bay in the south, and a large area offshore. Since the earlier marine reserve proposals were discussed, our knowledge about marine environments and what is needed to best protect them has expanded. Scientists now think that larger marine reserves may be more effective because a larger range of habitats are protected and the effect of fishing at the reserve edges is reduced. Having had overwhelming adverse reaction from the public, fishing industry, tangata whenua and community, DOC could not come back with the same proposal. But it is true that larger marine reserves are more effective at protecting more species and habitats. However, marine reserves do not protect against land-based pollution and poisonous plankton blooms. The entire proposed area has been devastated by this. 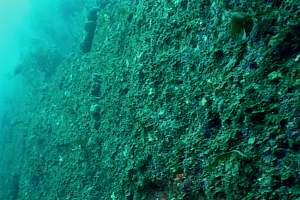 In 1993 the whole kelp forest disappeared, as did most sponges and other sessile filterfeeders and schooling fish. Recently in 2002 this happened again, but more devastating for sponges than for kelp. Many fish species also disappeared. Read Seafriends' study of this phenomenon www.seafriends.org.nz/enviro/habitat/survey93.htm. The most exciting discoveries were made in 2002, when a team of scientists and locals sent a remotely operated camera down to 100 metre depths north east of Rakitu. 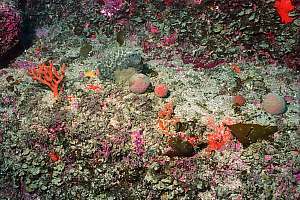 This area, shown as only slightly raised seafloor on the marine charts, revealed a remarkable undersea world - deep water reefs hosting coloured sponges, black coral colonies, jewel anemones - and kingfish. DOC produced a movie from which the image on the right was taken. The best scenes of the deep water survey by remotely controlled camera were shown in this movie. Yet these could not hide the overwhelming amount of mud covering the sea bottom, smothering organisms. The organisms showed known signs of stress such as the absence of juveniles. The large organisms in this movie have a story to tell, about how good conditions once were but no longer are. This whole area will deteriorate further with time, even when completely protected. life on a deep reef north of Rakitu. Marine reserves are the 'national parks' of the sea, where underwater features and marine life enjoy complete protection. Their purpose is to protect representative, unique or special marine habitats for scientific study and enjoyment. One cannot compare marine reserves with national parks. Our national parks are tracts of land which cannot be lived on or harvested because they are unproductive. On the other hand, the sea is entirely productive everywhere and can be accessed with ease. The national parks are not threatened by muddy sediment but the sea is. Because much of our underwater environment has been altered by human activities we need to protect bits that represent samples of what was originally there. Within a reserve, marine life is left to recover and flourish in its natural state - for its own sake and for future generations. As with national parks, people are encouraged to visit, marvel at and learn from marine reserves. Not true. The underwater environment is the least altered environment of all. 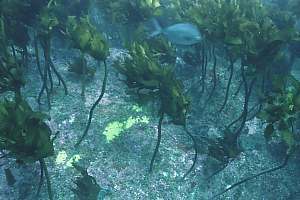 Its kelp forests have not been burnt for agriculture; nobody is living there; the seabottom has not been paved with roads; there are no invasive species like cats, rats, stoats, goats, deer, rabbits, possums. By far most of the marine life will not improve inside a marine reserve but some fished species will to some extent. Most Great Barrier Island locals know that the island's seas aren't as bountiful now as they were in 'the old days'. A marine reserve will help restore the balance and protect the marine taonga of part of Great Barrier's coast for the benefit of present and future generations. Speculation. Locals have worked hard to protect their coasts with better means than marine reserves. In 1992 they achieved a 1 mile commercial set net ban right around the Great Barrier and the Mokohinau Islands, with spectacular results. Where was DoC when they needed them? A marine reserve will do nothing to the areas outside and it will not address the causes of our problems. Imagine how our fisheries could look if the option4 Principle #3 of a Planning Right was enforced. It would empower the public to leave fish in the water, secure in the knowledge that those fish would not simply be reallocated to the fishing industry driven by insatiable export markets. Why is the NE coast of Great Barrier Island not what it could have been? The green girdle of islands located outside the coast of the mainland stretches from White Island to the Poor Knights, including Great Barrier Island. Visit White Island or the Poor Knights, and one experiences clear water supporting a profusion of biodiversity under water. Obviously, the distance away from our polluting shores plays an important factor. But why is Great Barrier not like the other, much smaller islands? Firstly, it encloses the Hauraki Gulf which fills with run-off from the mainland including that from the heavily polluted Waihou river. This runoff fertilises the plant plankton, resulting in dense plankton blooms and a severe reduction in underwater visibility. The over enriched waters of the Gulf have only two ways to escape: on the south through the Colville Channel and then along the Coromandel coast towards the Mercuries, and on the north through the Craddock Channel, around the Needles to the east coast of the Barrier. Secondly, the Barrier still has much barren eroding soils, a legacy from Kauri logging and poor land management. It should be no surprise then that the proposed area suffers from serious degradation. But what evidence exists? It is sad that scientists and DoC remain uninformed about the seriousness of the situation, even though it is there for all to see. Why have no surveys been done since 1990? The two most devastating events happening since, have not been noticed! Obviously, a marine reserve will not 'revert this environment to what it once was', as repeatedly claimed by DoC and others. IT WILL NOT WORK! f036813: This vertical wall was once covered in lush rock dwelling colonies of animals like colourful sponges, anemones, bryozoa and hydrozoa. f036814: This is a closeup of the wall on left. 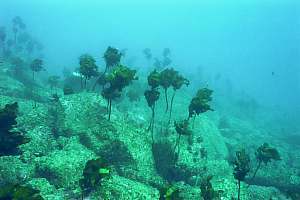 Successive ecological disasters have cleared the rock, allowing a small seaweed to colonise it. f036827: Remnants can be found of what once lived on the vertical wall, but everything is covered in a sticky mud. f036819: On a ledge a number of surviving sponges attempts to recover from near-death, but all are covered in sticky dust. f036734: Behind a rocky outcrop the cleansing action from waves can be seen. 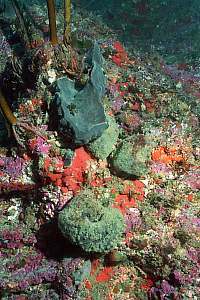 In the top right, the sessile organisms are all clean, as is the large grey sponge. But lower down, three grey sponges are dying because of being suffocated by sticky dust. Most organisms occur in an advanced state of stress. f036735: another image showing how orange stick bryozoa are just able to survive high up the rock in the current produced by waves. But lower down organisms are dying as they have been choked by sticky dust. Over time this rock will be as barren as the others. The Government committed, in the New Zealand Biodiversity Strategy (2000), to protect 10% of New Zealand's marine environment to help conserve marine biodiversity. A network of marine protected areas, which together protect a range of unique and diverse habitats and ecosystems, will contribute to this target. it may also enable marine species to move between protected areas - a series of safe havens within movement range of adults or juveniles. The Government's policy is flawed. Marine reserves do very little for marine biodiversity. For the non-fished species they have no benefit, neither for the fished migratory species as they move in and out of reserves. Only for fished resident species will they be of benefit but these can be protected in other ways. The network idea lives only in the minds of protagonists and has no ecological foundation or scientific proof. Marine species moving between protected areas will be caught just like those who live there permanently. There exists no scientific proof that marine reserves are of benefit by their contribution of juveniles. So far just 0.1% of the coast around mainland New Zealand is protected within 15 marine reserves. There are three small marine reserves in the Auckland region: Cape Rodney to Okakari Point (near Leigh), Long Bay to Okura and Motu Manawa (Pollen Island) in the Waitemata Harbour. Another - Te Matuku Bay on Waiheke Island - is awaiting approval from the Minister of Fisheries. Further north is the larger Poor Knights Islands marine reserve, and to the south Te Whanganui-a-Hei (Cathedral Cove) on the Coromandel Peninsula, and Mayor Island (Tuhua) marine reserves. It's the beginning of a network that would be greatly enhanced by a marine reserve on Great Barrier's north-east coast. A marine reserve would help us to retain, in a natural and healthy state, the great variety of plants and animals that live in the diverse marine habitats found on the north-east coast of Great Barrier Island. False. The marine reserve does not protect against degradation, which is a major problem in the proposed area. Help safeguard against environmental degradation and provide a benchmark against which to measure human impacts in other areas. False. They do not protect against degradation, as shown by over 2/3 of our existing coastal marine reserves including Goat Island. Yes, they can be used as a benchmark but it would be much better if scientists started studying degradation, for which there exist no benchmarks: it happens everywhere. Help rebuild depleted stocks of snapper, crayfish and other species, restore kelp forests and the health of marine ecosystems. There are better ways to do this, like fisheries regulation. The health of the marine ecosystem is in serious decline. Increase the range of fish types, as rare and more vulnerable species flourish in the marine reserve. Rare species belong to areas where they breed. They will continue to be rare, with or without a marine reserve. Protect the many marine processes and species we don't yet know about. False. These are just as much affected by degradation as others. Act as a breeding area and reservoir for depleted marine species and provide a source of larvae to boost populations inside and outside the marine reserve. A nice idea, but without scientific proof. Name some of the species that will benefit. Mature snapper move out of this area into the warm Hauraki Gulf to spawn. Protect large, old experienced animals which may have important genetic and social values not protected under fisheries rules. 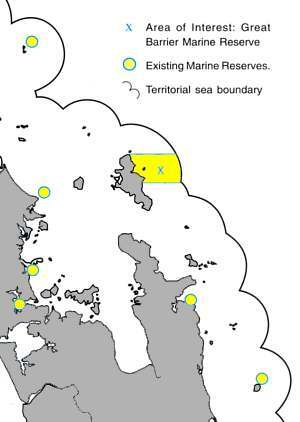 This is indeed what a reserve does well, but there are other ways for achieving this - a closed area for trawling and maximum size restrictions for instance. But its value should not be overstated, since even at the Poor Knights such large, old animals have not appeared. Allow fish and marine life to be observed in their natural habitat, natural sizes and numbers and exhibiting natural behaviour. There is no objection against marine reserves in hotspots, attracting both fish and divers. Point out on the map where such a hotspot is. Provide a window on a beautiful and fascinating underwater world. Marine reserves are ideal places for scientific study, education, snorkelling and diving, underwater photography, swimming, exploring rock pools and eco-tourism. Only when they do not degrade, have clear water and easy access, will marine reserves be used by divers, underwater photographers, eco-tourism and for education. It must be remembered that the best dive spots in Leigh are outside the marine reserve in an unprotected sea. People undertake a range of activities on the north-east coast. Responses to the 1991 questionnaire showed the most popular pastimes were swimming, sightseeing, surfing, sunbathing and beach walking. Next were boating (including sailing, windsurfing and water skiing) and recreational fishing. Other activities were diving and snorkelling, education, scientific study, traditional and commercial fishing and tramping. How would a marine reserve affect you? The only activities that would be affected by a marine reserve in the area are fishing, shellfish gathering and removal of shells. Taking any marine life, including fishing and gathering shellfish, rocks or seaweed, is not allowed in a marine reserve. However, fish caught outside a marine reserve can be carried through the reserve. The problem of the Marine Reserves Act is that it provides only one tool, permanent and total closure to extraction. It is the wrong tool for this area where sustenance fishing is of major importance. Not a word is mentioned about this in the proposal. A marine reserve under the Fisheries Act however, would allow many degrees of flexibility to produce the right solution for this area. A marine reserve on the north-east coast may have economic and social implications for commercial and recreational fishers in the area. However, fishing is likely to improve in the areas near the reserve and, in the long term may benefit stocks further afield. Visitors can take boats into marine reserves and anchor but are encouraged to minimise disturbance to the sea floor. The spill-over effect of a large marine reserve like this is but a very small fraction (5%) of the lost fishery. Although at the moment people have the right of 'free and innocent passage', if fish is found on board, the onus of proof that the fish was caught outside, will be on the fisherman and not on DOC (Marine Reserves Bill now before parliament). In the same bill one can be fined $5000 for uprooting a kelp plant. A marine reserve managed by DOC is just a nightmare. A marine reserve can boost local tourism and service industries as it becomes established. For example, the large number of visitors to the marine reserve at Leigh has substantially benefited the local economy. The benefit to Leigh's economy is a myth well spread. The total benefit amounted to no more than an income for four families, which evaporated when DOC decided to ban feeding the friendly fishes. Here at the Barrier, one must not expect people to visit the proposed marine reserve like the one at Leigh which is only an hour's driving from Auckland. Educational and recreational activities are encouraged in marine reserves, as well as scientific research and monitoring. Tangata whenua have a long history of using Great Barrier's diverse coastal resources. They continue to be kaitiaki and exercise manawhenua over their interests in the north-east coastal area. Resident tangata whenua are Ngati Rehua hapu and Ngati Wai iwi. Ngati Maru also have an interest in the north-east coast and marine area. Many tangata whenua wish to act as kaitiaki for the estuary, within an overall marine reserve on the north-east coast. Many tangata whenua also support continued but limited harvesting of shellfish from Whangapoua Estuary. This is not allowed in a marine reserve but tangata whenua needs could be accommodated by excluding part of the estuary from the reserve boundary. It is here in the glossy sales brochure that we would expect to find reference to the suite of customary maori management tools that exist as a result of the 1992 Treaty of Waitangi Fisheries Settlement Act and the 1996 Fisheries Act. Why do DoC continue to pretend that these statutes are irrelevant? The Department of Conservation looks after and administers marine reserves but relies on the support and involvement of the local community. Marine reserve regulations are enforced by DoC, sometimes with the help of people appointed as honorary rangers. Local people are well placed to be guardians of a marine reserve, to watch over it and discourage potential offenders. Despite overwhelming scientific evidence that local management and co-management are most desirable, DOC has explicitly written the new marine reserves bill to exclude this. Locals must insist on gaining control and management over any marine reserve, including control over its entire budget. Obviously, DoC and the Marine Reserves Act are not the right agents for this. Local residents should be aware that policing of this reserve is possible only by them. The vast area from 2 to 12 nautical miles out in sea is probably unpoliceable and will be poached regularly unless full co-operation from all fishermen is obtained. The Department of Conservation would like to protect the full range of coastal and marine habitats on Great Barrier Island's north-east coast. This would provide a significant area for scientific research, and ensure the survival of an outstanding legacy to pass on to future generations. 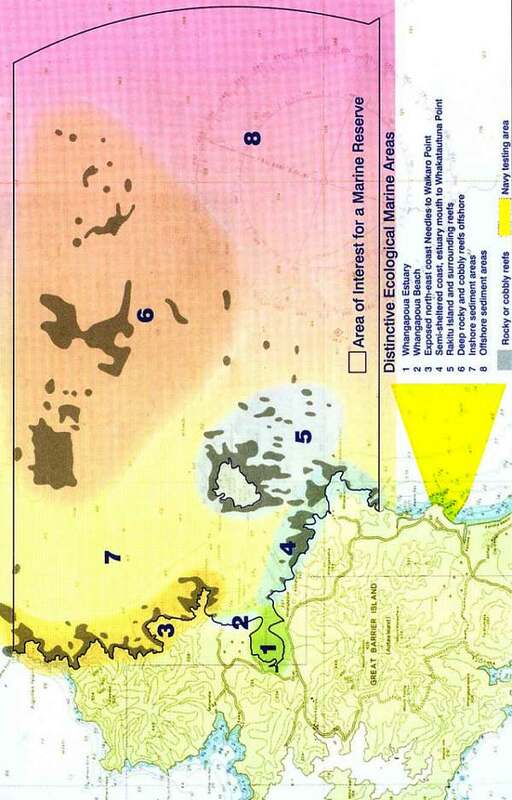 The area under investigation for a marine reserve is shown here. It extends from Korotiti Bay to Needles Point in the far north, and from mean high water springs out 12 nautical miles to the limits of the territorial sea. The area includes a wide range of marine habitats, many of which are not represented in marine reserves elsewhere. These include the estuarine and beach areas of Whangapoua, exposed north-east coastline, semi-sheltered coast, Rakitu Island and its surrounding reefs, deep rocky reefs offshore, and inshore and offshore sediment areas. Click on the map for a page-sized version. Only faintly visible at the bottom of the map (but here marked in yellow) is the navy testing area where anchoring and fishing are prohibited. This de-facto marine reserve has not been included in the proposal, even though it would have been a good starting point. There has not been any research conducted to ascertain whether or not the closed area has been beneficial to the environment. Please note the 1994 proposal boundary (marked with a dashed line) and the smaller boundary recommended by the Steering Committee in 1991 (marked with a solid line), which had the support of the locals. The 'best' size for a marine reserve depends on what you are trying to protect. For some species a very small marine reserve may be enough to protect a local population. For species that travel or migrate a very large marine reserve may be required to be effective. Some very mobile species may only take up temporary residence within a reserve. Research is continuing into effective sizes for marine reserves. Even more important than size is the right choice of boundary. Marine reserve boundaries must follow ecological boundaries that are 'meaningful' to fish. A circle around an island such as the Poor Knights, is such an ideal boundary. The boundaries in this proposal are convenient to humans but insignificant to fish (straight lines, territorial sea, promontories, etc.). Whatever the size we know that fishing for snapper and crayfish just outside marine reserve boundaries affects numbers in the reserve. Fishing causes these species to be generally less abundant closer to the edges of reserves compared to the middle. Recent research at Leigh shows reduced snapper and crayfish numbers within two kilometres from the end of the five kilometre long reserve. A bigger reserve minimises this effect. The illustration below shows the 'edge effect' close to the reserve boundary. Larger marine reserves enable a wider range of habitats to be protected. So far marine reserves in the Auckland region are relatively small. A large marine reserve at Great Barrier would protect a wide range of habitats, suffer minimal effects from fishing at the edges of the reserve, and would add significantly to the network of marine protected areas in the region. Government policy is to protect 10% of New Zealand's marine environment (the Territorial Sea to 12 nautical miles offshore) by 2010. To date we have protected about 4% of our territorial sea, but just 0.1% around mainland New Zealand . so we have some way to go to meet this goal. Government's policies are flawed. The 10% is based on a comparison of the sea with our national parks, which is invalid. Scientists have not woken up to the seriousness of environmental degradation in the sea. The 735,000 hectare Kermadec Islands marine reserve is much larger than any other marine reserve around mainland New Zealand and makes up about 3.9% of our territorial sea. What's special about the north-east coast? Along much of Great Barrier's north-east coastline, natural habitats extend from the hilltops to the coast and offshore. This is uncommon in northern New Zealand due to the extent of coastal development. Because most of the land next to the proposed marine reserve is already public conservation land we have a chance to protect an unbroken sequence of natural habitats - land, estuary and sea - and manage them together. The link between land and sea is much overestimated but the link between salt and fresh water is real. It is important to remember that the sea is an entirely different environment and that it needs to be managed in a different way. DOC has shown to be the wrong managers for the sea but they are excellent for the land. The north-east coast is characterised by exposed rocky shores but has a wide range of coastal features: a sheltered enclosed estuary, an open surf beach, sheltered sandy beaches, boulder beaches and more sheltered rocky shores. Offshore there are sandy and muddy sediments, gravel beds, reefs and deep rocky ground. Each of these features supports a collection of marine plants and animals adapted to the local conditions. Warm waters from the East Auckland Current bring a subtropical influence to the marine life found there and increase its biological diversity. These waters are often remarkably clear which, with the diverse seascapes and rich marine life, makes for spectacular underwater viewing. The area is one of the last strongholds of the giant packhorse crayfish which migrate to shallow waters around north-east Great Barrier Island each season. There are better ways to protect packhorse crayfish. Besides, they have not been seen for many years. The degraded environment is not enticing them back. The little modified Whangapoua Estuary is home to about one third of our remaining endangered brown teal, New Zealand's unique little duck. Sand flats and spits around the estuary are also important feeding and roosting areas for a significant population of the threatened New Zealand dotterel. Do fishermen threaten the brown teal or dotterel? Surveys undertaken within the proposed marine reserve show a wide variety of habitat types, including remarkable deep water reef areas with black coral, sponges and a wealth of invertebrate life. This exposed area at the northern end of the proposed reserve is characterised by steep dropoffs and spectacular underwater scenery. Here, hydroids and seasquirts feature at depths of 15-20 metres and schools of kingfish and other pelagic fish are common. Rakitu, a small island six kilometres off Whangapoua beach, has excellent scuba diving. Its rocky shores plunge to depths of over 30 metres where colourful sponges and other encrusting animals cover the rocks. Underwater archways and caves are dotted with light-shunning hydroids or sea fans and beautiful jewel anemones. Plankton-feeding demoiselles and blue maomao are often present. In the archways low light levels allow marine life normally found in much deeper water to live at depths accessible to snorkellers. Protected from wind and waves by Rakitu, Dragon Island is only a short snorkel from Harataonga. The eastern end of the island hosts a variety of deep gullies and huge boulders provide sheltered nooks and crannies for an array of reef fish. orange and green wrasse and sandagers wrasse give a subtropical flavour to the diverse fish fauna which include black angelfish, demoiselle, porae, blue moki, red pigfish, john dory and abundant red moki. Named after a rainbow wrasse seen here, as well as the multi-coloured sponges and other life on the seabed, this offshore reef sits between the Harataonga coast and Rakitu Island. 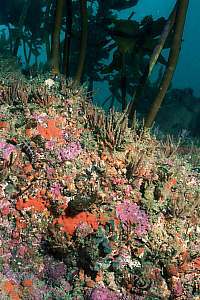 At 25 metres, it's an intermediate habitat between the deeper sponge garden and shallower Ecklonia kelp forest. 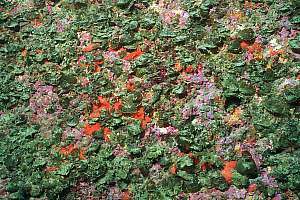 Rock outcrops emerge from a gravel floor, which has a rich flora of small red seaweeds. 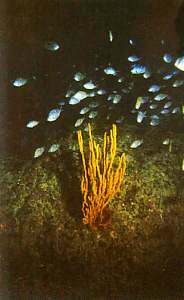 The rocky reef hosts Ecklonia, mixed with sponges and hydroids, and harbours large fish such as porae and snapper. Multitudes of small fishes hover over the reef feeding on plankton drifting by. diving depths at Rakitu The photos shown here, taken by Dr Roger Grace, appeared in the colourful 16-page brochure. Although rendered rather dark, they still reveal the degraded nature of the rocky shore environment. The depicted orange finger sponges (Raspailia topsenti) are very hardy to degradation by mud. It is remarkable that other types of sponge are absent from these images. The kelp plants are all the same age since they were destroyed in 1993. It is an unhealthy and unnatural forest now. The demoiselles in the photo are all juvenile. In 1991 and in 2002 the majority of demoiselles died in this area. 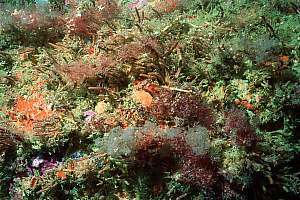 In 2002 nearly all encrusting sponges, bryozoa and hydroids died, as did many fish. In this photo also the influence of mud can be seen. The pink coloured rocks extend above the sea bottom. They are angular in shape meaning that they are not moved very often, unlike rolling stones. All plants in the image are short-lived and attached to the clean parts of the protruding stones. This is very much the look of a degraded environment where grazers such as urchins, chitons and top shells have disappeared recently. 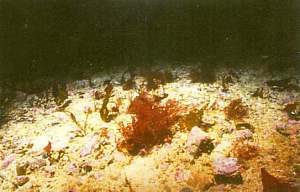 Red seaweeds on the gravel bottom. Deep rocky reefs occur to the south-east, north and north-east of Rakitu Island, in depths of about 110 metres. 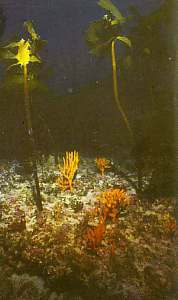 surveyed by DOC in 2002 using a special underwater camera, this rocky ground supports a rich variety of sponges, black coral and other invertebrates, and is suitable habitat for hapuku. Muddy sediments of the continental shelf to about 150 metres depth extend to the 12-mile limit of the territorial sea. 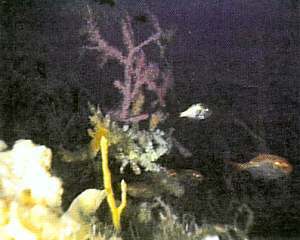 Deeper continental shelf habitats like these, with their special seep water animals, are not represented in other marine reserves. Ask for the video to see how much this environment is covered in mud. Whangapoua Estuary is considered nationally important due to its large size and undisturbed nature. Conservation land surrounds the estuary, which provides habitat for an array of birds, shellfish and fish, as well as the smaller bacteria and fungi on which the food chain depends. Conservation land does not surround the estuary, but there is some near it. The bacteria and 'fungi' on which the food chain depends are found in every drop of sea water and every square millimetre of sea bottom. The estuary 'feeds' the surrounding coastal marine communities with nutrients supplied from the mangrove forest, seagrass and wetland areas. Snails, crabs, worms and shellfish feed on micro organisms in the estuary, which are then preyed on with each rising tide by snapper, yellow-eyed mullet, flounder and rays. Along the water's edge wading birds feed on rich pickings in the mud and sand. Mangrove forests, seagrass and wetlands do not supply nutrients. The mud from the land does. The number of marine fish species depending on an estuary is very small but any species may occasionally stray there. Estuaries like other sheltered places, help recruitment (settling out from the planktonic stage) of some marine species. Yellow eyed mullet has been observed to go upstream into freshwater and wetlands to spawn. The estuary supports significant numbers of the threatened New Zealand dotterel and is a stronghold for one of our most endangered endemic ducks, the brown teal. The spit is a high tide roost and the mudflats a feeding ground for coastal birds, including the Pacific golden plover, banded dotterel, bar-tailed godwit, variable oystercatcher and pied stilt. The expansive pipi and cockle beds in the estuary are an important shellfish gathering area for local people and tangata whenua. From consultation it was noted that shellfish are less abundant elsewhere on Great Barrier and that shellfish populations at Whangapoua are under pressure from the summer influx of visitors to the island. Many locals have said they should be able to continue to have a sustainable but small harvest of the main shellfish species from the estuary. This view has been endorsed by tangata whenua as kaitiaki of the estuary. Shellfish beds thrive from a moderate amount of exploitation. 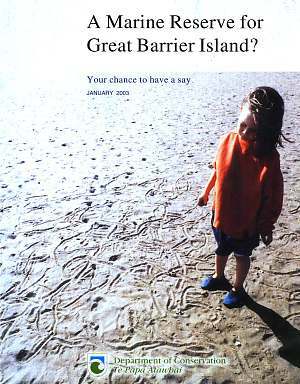 The front page of the coloured brochure shows tracks in the sand caused by cockles on the move from crowded areas. This is a symptom of under-harvesting. By judicious harvesting, people can enhance the productivity of cockle beds. The problem is that the MRA does not provide enough flexibility for allowing a limited and supervised harvest. DOC is the wrong agent and the MRA the wrong tool for marine reserves in the 21st century. To address these concerns, an exclusion zone could be established within the Whangapoua Estuary to allow an ongoing sustainable harvest of shellfish. DOC is seeking your views on whether an area should be set aside for shellfish gathering and in what location. After further consultation with tangata whenua, fishers, interested groups and the Great Barrier community, and consideration of feedback on this discussion document, DOC will make a formal application to the Director General of Conservation for a marine reserve. Members of the public then have two months, from the time the application is notified, to make submissions. The Minister of Conservation will make the final decision on the application, which also requires agreement from the Ministers of Fisheries and Transport. Locals are very wary of DoC handling the submission. They have been through the process twice. When will a final rejection be respected? There was support for a small reserve. Rejected by an overwhelming majority. To establish a marine reserve conforming to provisions of Sections 3(1) and 3(2) of the marine Reserves Act 1971. To protect and maintain a large section of the diverse marine ecosystem and biodiversity on the north-east coast of Great Barrier island, that is ecologically continuous with already protected adjacent terrestrial habitats. To protect a wide variety of marine habitats and their marine life, including continental shelf deep water rocky and sediment habitats not represented in marine reserves elsewhere. To provide a safe haven for several species of marine animals presently impacted by fishing, and to allow them to recover to their natural population and social structure. To provide a marine reserve which is large enough to minimise side effects of fishing, and to provide a large central core area of protection to allow ecological, social and behavioural characteristics of marine communities to function without interference. To provide opportunities for scientific study, including study of the relative merits of large versus small marine reserves. To provide opportunities for public enjoyment of non-extractive high quality marine recreational activities. To form a link in the national network of marine reserves in accordance with New Zealand's Biodiversity Strategy (He Kura Taiao) and to contribute towards the Government's target of protecting 10% of New Zealand's marine environment by 2010. Do you really think the above objectives will be met? The era for coastal marine reserves has passed. Our seas can be saved only by saving the land and by improving fisheries regulations. Our only option is to stop the whole marine reserves process so that lies, myths and fallacies can be ironed out and solutions found that will work. An A4-sized map is also available. Visit www.seafriends.org.nz for more information on marine conservation and reserves.